Many outdoor living features were included in the 690 square foot yard. A seating area centered around a combined fire and water feature was created as a destination at the end of the yard. When burning, the natural gas fire feature emits 35,000 BTUs of heat. Prior to the transformation, this small yard was unattractive, unused and felt boxed in. A before shot of the covered patio. The Challenge:Design an outdoor living space, with a kitchen, hot tub, dining area, sitting area, fire for warmth and a water feature all in a 690 square foot townhome backyard. “Despite the limited space, my client wanted many entertaining features. My goal was to include all their requests while ensuring that the yard would appear expansive and uncluttered,” says Terry Sims of The Garden Artist in Boise, ID. The Client:The owners of this 1980s contemporary townhome are empty-nesters who entertain often and travel frequently. They were looking for a low-maintenance design that would extend their living space outdoors. Their original budget was $30,000, but this was later increased to $52,000. Terry selected plants for four season interest, focusing mainly on evergreens and perennials with nice texture and color. Three trees were also planted: two weeping cherries and a thunder cloud plum for its deep color. Drip irrigation was installed as an efficient and low-maintenance way to keep the plants watered. The kitchen and hot tub were angled to avoid crowding and funnel the eye to the sitting area at the end of the yard. An “s” curve path, created with tumbled concrete cobblestone pavers, elongates the yard. To eliminate the boxed in feeling, the fence was painted blue/grey, which helps it fade into the background and transition smoothly into the sky. 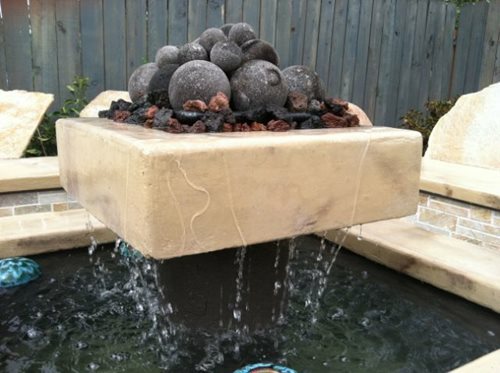 The requested water and fire features were combined into one double duty design element. Aside from saving space, Terry enjoys designing these combinations because they are a one-of-a-kind novelty that no one else has in Boise. For budget reasons, a custom hot tub was not an option. Instead a portable tub was sunk halfway below ground level, which reduces its overall mass and provides unobstructed views of the seating area. A freestanding pergola with an open roof covers the hot tub, helping to create privacy from the neighbors’ second story windows and a comfortable, protected atmosphere for those using the tub. The outdoor kitchen was designed to leave a small footprint. The structure features a 36 inch natural gas grill with a stainless steel cabinet and drawer. Two feet of counter space on one side allows for prep space, while three feet of counter on the other side provides room for buffet style dining. The countertops are made of poured concrete that has been stained and sealed. A visual flow was created throughout the yard by restricting the number of hardscape materials. “Consistent repetition of the materials throughout the yard was essential for making the design work in such a small space,” Terry explains. Pavers and a decorative concrete overlay were used for paving, while a stone veneer clads the BBQ and seating area. 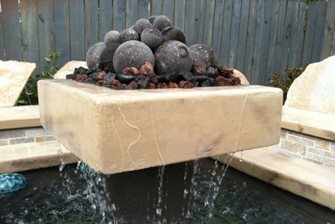 Natural boulders break up the lines around the hot tub and the combined water and fire feature. Additionally, the existing covered patio was transformed into the dining area the clients desired. Since the extension of the roof line was not up to code, Terry and her crew had to make modifications. “The footings were too shallow and had cracked due to frost and the height was only six feet, which was too low for comfort and safety,” explains Terry, “So we repositioned the beam, adding an extra eight inches of height and dug down to repair the footings, ensuring they were 24 inches deep.” The existing concrete was resurfaced with an overlay that was stamped with a slate texture and colored to tie in with the pavers, veneer and natural stone used in the rest of the yard. Since it can get quite cold in Idaho, Terry also had to consider ways to tailor the design to the climate. The natural gas fire feature puts out 35,000 BTUs of heat, which allows the homeowners to use the space 9 months out of the year. Additionally, the hot tub was placed close to the back door so that it could be easily accessed during the snowy months.